Take your surveillance system with you anywhere using the new solar powered mobile surveillance solutions from Optiview. 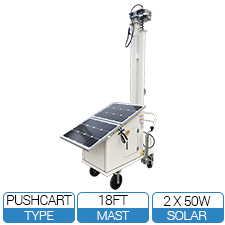 These solutions include solar powered trailers and pushcarts that can be custom finished for your surveillance needs. 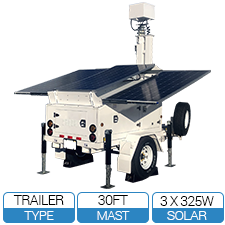 The all new AL3500-GS is a modular solar-powered mobile surveillance trailer with infinite possibilities. The trailer can be set up by just one person, putting lighting, motion detectors, infrared cameras, and HD cameras at your fingertips in minutes. The AL3500-GS combines speed and flexibility to give you security the way that YOU need it. Using the solar panels, the unit can operate 24/7, and for emergencies, the trailer comes equipped with a backup generator that can offer 200 hours of operation on a single tank of fuel. The AL3500-GS Trailer’s 30’ retractable mast puts eyes in the sky, and optional 4G connection means that you can monitor your work site or event space from any web enabled device. 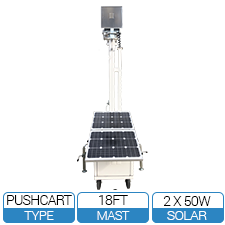 A smaller, more compact version of the Mobile Trailers are the Mobile Push Carts which hold 2 x 50W solar panels and have an 18' retractable mast. These push carts are ideal for smaller venues such as deploying during religious events, school or sporting events and more. If you are unsure which platform is right for you, click here to download a comparison matrix. Compare the smaller cart platform and larger DOT trailers with, and without back-up generators.